I have a thing for eye creams. Probably amongst the personal care products I use, I take great pains in investing in eye creams. The eyes as many know, are the windows to the soul and though I don’t believe in extreme measures to reduce the signs of aging (we can all age gracefully) I do feel that having a brighter “frame” for what we look out into the world with should be given a lot of TLC. There are several and the market that address the fine lines, to the deeper ones, and I try to stay clear of those that have a lot of chemicals and artificial fragrances. Regular use of any of these products is highly recommended for best results. You want a dramatic shift in your facial mapping? Go for this line that just won The Anti-Ageing Product of the Year award at the Asia Spa Awards 2012. It covers all the bases, from your eyes, to lips, to face, you name it. Plus it’s lightweight and pumped up with all kinds of good stuff for you to see and feel it almost instantly. I road tested this on a friend who for many years has exposed herself rather irresponsibly to the sun and in just a week, at a dinner, it was remarked how good she looked. We kind of smiled at each other slyly, knowing that she had a secret weapon to her new-found youthfulness-OK well, after this blog, maybe not so secret anymore. We concentrated on her expression lines around her eyes, and already that made such a big difference. She is now encouraged to try the entire line on the rest of her face! Among the products I looked over, this was the most appealing for my particular situation. My eye lines are not yet too dramatic, but a little preventive love was needed. I liked that this product contained AppleStem Cell Extract, Vitamin E and Peptides among other ingredients. After two weeks of use I did notice that the area in my eye appeared plumper and softer-even if after a weekend where regular sleep was hard to come by. My friend’s didn’t notice how tired I was, and I’m crediting it to this eye cream! 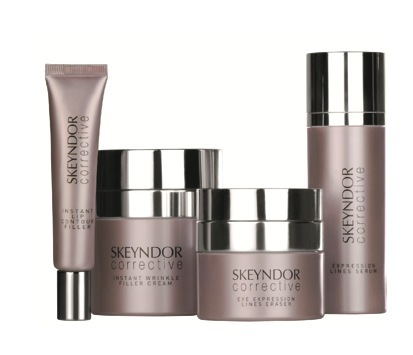 For more information on where to purchase Skyendor and NeoStrata products call (0917)-5579619.